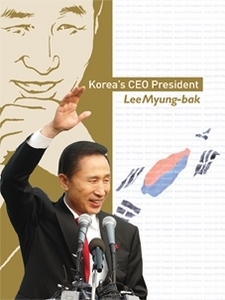 Korea's CEO President: Lee Myung-bak introduces English-speaking readers to Korea's new president. It takes a look at the remarkable life of President Lee, from his poverty-mired youth to his meteoric rise to become Hyundai Construction's CEO at the young age of 35. It also covers his years as Seoul mayor and examines his major policy initiatives and vision. Short and light, the volume gives you the information you need to know in a quick and easy-to-read format. Up to the age of 20, poverty would be Lee's permanent companion. Or, as he would put it, "Poverty was stuck to my family like a shell to an oyster." Due to the war, Lee's father lost his livelihood, and the family had to move to a home in the mountains. They made their home on the site of an abandoned temple from the Japanese colonial period. On this spot, some 15 families found shelter. The Lee home, a one-room house, lacked even the most basic facilities. It didn't even have a kitchen. On a lucky day, local residents might be able to get work as day laborers. Not a day went past without the sounds of poverty --- people fighting, stomachs growling, sick people dying. The family lived on the lees left behind after rice wine is drained. Lee, as the youngest son, ran errands for a local brewery, and could purchase the cheapest lees to feed his family. At school, Lee couldn't even dream of eating a proper lunch. Instead, in a futile attempt to quench his hunger, he would drink water at lunchtime.